Helga’s Post # 87: What’s a poor writer to do with a completed manuscript of a beautifully told story, edited and polished to perfection? Not as simple as it used to be not so long ago: draft a query letter to an agent who might fit the bill, print the first three chapters and a synopsis, and mail it all off in an 8.5×11 envelope with a self-addressed stamped (all-important) return envelope. And wait and hope for a positive reply. And wait some more. Sometimes three months, maybe six. Maybe the reply never comes. And to get more discouraged with each rejection letter that arrives one after another with cruel regularity. But there’s a new wind blowing. Not so new to some savvy writers who take the business side of writing as seriously as the trade itself. It’s a brave new world for writers, as we have known for some time. The recent blog posts from 5writers Silk and Joe have tried to do justice to this complex topic by raising some fundamental issues and shining the headlights on what we writers all need to come to grips with and understand. From comments we received, not surprisingly, there is frustration and rejection of what appears to rapidly become the new business model. 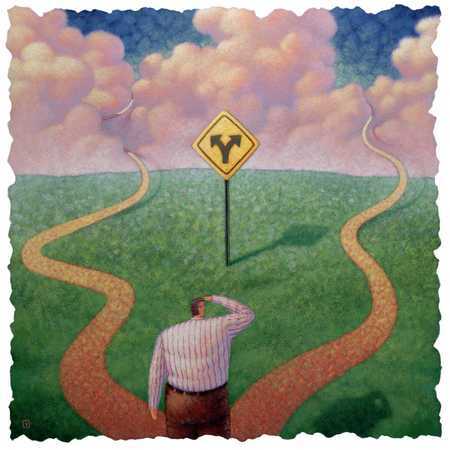 So which fork in the road should a writer take? Indie, self-publishing, Amazon, New York literary powerhouses for traditional publishers? What road will lead to our stories being read by most readers – or not at all? That may well be the conundrum of brave new world writers in times to come. After all the dust has settled on the current debate, it may well turn out that the cards are dealt slightly, or perhaps a lot more than that (time will be the judge), in favor of writers, at least on the surface. An entirely new world is opening up to writers who, for the first time ever, get a chance to have their stories read, stories that traditional publishers deemed not to have been worthy of sharing with the rest of the world. Sort of brings to mind some historical milestones in Czarist Russia and pre-revolution France that didn’t end too well for the establishments in power. Remember when you drove to Blockbusters or some other video-rental store to pick up a movie or two for Saturday night? Not so long ago in years, but an eternity in terms of technological advances. The big question of the time was Beta or VHS. Those shops are gone, relegated to the dustbin of so many other industries now redundant. Is there a parallel with publishing? How an industry could go into oblivion because they failed to reinvent themselves, or simply could not keep pace with innovation? But let’s not fool ourselves. The traditional publishing industry is not going to roll over and play dead. They surely have some powerful ammunition in their arsenal. Such as client lists that boast the crème de la crème of authors whose books we all have come to love, the books that became successful movies, books we will always willing to pay full price for. Books that we may not be able to borrow from our local library, because the publisher doesn’t have to make it available. So, if you are one of those writers mentioned above who has worked hard and sacrificed much to produce one or more marketable manuscripts (meaning final drafts, edited and checked for every possible error, even the most minor), you’ve likely done the research. Which fork in the road to take? Like to see your book prominently displayed on Barnes & Noble or Chapters shelves? How far will you go and how long will you wait until that happens? You make more money per book every time you sell one. You can get your book printed and have it ready to sell very quickly. You have total control over your cover design and title. No one can tell you to edit anything out. You own all the rights, except for the ISBN. If you already have an audience for your talks or seminars, you can use the book for immediate back of the room sales. You can print in small quantities. You can sell your book on Amazon (the firm Author One Stop will put this in place for you and you will receive a 20% royalty). – My note: What? Shouldn’t this go into the ‘cons’ section; 20%?? Distribution is limited as chains, for the most part, do not accept self-published books. Marketing and promotion is your responsibility (similar to traditional publishing). You’ve got to do everything yourself or nothing is going to happen. If you aren’t already out speaking or giving seminars, or in the public eye where people will have exposure to you, sales can be quite challenging. You’ve got to put out the money for printing. Most reviewers won’t review books that are self-published. We can expect that this passionate and probably brutal debate will rage on for some time to come. It will be fascinating to watch this huge turf war unfold. Meanwhile, let’s enjoy our trade and apply our craft. What greater achievement than creating stories that people will remember and talk about months and years after they finished reading? Nothing succeeds like success. It starts and ends with one thing: Having a novel that pulls readers in. Telling a story that people are willing to fork over 99 cents or $19.95. Making sure your story premise is big enough, deep enough, with enough conflict to turn pages no matter what the time of day or night. With enough of our own heart in it, with story events that are monumental, be that external, emotional or best of all, both. But that’s not the end. It’s only part of it. Because now we have to decide how to get those stories into our readers’ heads. Full-service publisher? Indie? Doing it all ourselves? Surely the discussion over the different options for publishing will continue. Surely also the confusion will deepen for a while until the crystal ball turns less cloudy. Personally, I welcome the opportunities of writers having more viable options. However, it also raises the question of pay-off: how much energy from our creative process are we writers robbed of, how much time and working in uncharted territory are we willing to serve the goal highest on the agenda of many, if not most writers, namely getting published? Which brings us back to the question that this blog wrote about a few posts back, ‘Why do writers write?’ Just like a good story, this question is taking on the shape of an incomplete circle that will ultimately close. Until then, I will just carry on with what I love most: create and write stories. I will worry about publishing when I am done. Maybe I have a one-track mind, but I can’t – or am unwilling to – do both at the same time. This entry was posted in Self-publishing and tagged Amazon, Indie, Rayne Hall, self publishing by Helga Bolleter. Bookmark the permalink. So very well expressed, Helga. Always learning from these posts. You all lead me to think more deeply. Haven’t nearly all of us had to go for the brass ring? I did–getting published versus doing it yourself. I wouldn’t rule out seeking a publisher for some types of books where I think I’d be truly at sea driving my potential readership to Amazon. We can do both. You have the wisest words of all regarding setting priorities. First write. Think of nothing but that. It’s difficult enough with the angst of what’s next. Also regarding 20% royalties at Amazon, for instance, for Kindle copies–and 95% of sales of my books are now through e-books–a price of $2.99 or more gets you a 70% royalty. Pros and cons, pros and cons. Helga reminded me I better get back to work. Thank you, Elizabeth, truly! I am glad you approve of writing as the number one priority. Technology is changing so fast, it’s conceivable that the entire publishing canvas will have changed to something entirely different by the time I have a marketable manuscript. I am sure the process will morph into an activity less cumbersome, frustrating, confusing and time-consuming. It has to. Because the whole publishing business at present is likely too daunting for many or most writers who simply write for the love of it. What about doing what I am doing? Sherrie, best of luck with Secrets and Lies! I look forward reading it, as I also write historical novels (about the Cold War set in Vienna in 1958 and a sequel of sorts about the war against heroin in 1972). I am intrigued with your marketing strategy. Thanks for sharing. Marketing strategy?! Not sure this qualifies. And I can tell you now that I wouldn’t want to do this again. People mostly act like I am asking them to GIVE me a few thousand dollars, not buy a product or service. Cest la vie! We live and learn. I wrote that post BEFORE I got so frustrated. I sure hope I find enough readers to write good reviews so I don’t have to feel like I am pushing things down people’s throats! Your books sound fascinating! Are the on Amazon? What are the titles? I go back and forth as to how I want to publish when a manuscript is ready. Most days, I lean toward the independent route because I’m not sure how many more rejections I can handle. But if the story ends up with potentially wide appeal and lends itself toward creating a tight synopsis, then I may just reconsider…. JM, you and I and legions of other writers are wrestling with the same decision. The good news is that we have more options than ever before. We can take control over the process while before all we could do is a daily trip to the mailbox to check for rejection letters! But it means more work too. As Silk was saying in one of her posts, we are all in sales. Thanks for your comment! I can sell the IDEA of reading. I can sell the IDEA of learning. But I hate the idea of selling a product. I don’t know. Maybe it will feel different when the book is out there. We’ll see.